Nikon UK is pleased to announce the release of the AF-S NIKKOR 24-120mm f/4G ED VR, a brand new 5x zoom lens for FX format D-SLR photographers. Nikon UK is pleased to announce the release of the AF-S NIKKOR 24-120mm f/4G ED VR, a brand new 5x zoom lens for FX format D-SLR photographers. The 24-120mm focal length continues to be a unique proposition in the NIKKOR lens range and the new version features a fixed f/4 aperture throughout the zoom range. It incorporates Nano Crystal coat and Nikon?s second generation VRII system. Zurab Kiknadze, Product Manager Lenses, Accessories & Software, Nikon Europe says: ?The AF-S NIKKOR 24-120mm f/4G ED VR lens offers excellent value and performance in a compact package for adventurous photographers everywhere. It is the second f/4 aperture VR zoom lens introduced this year that broadens the options for Nikon photographers. The AF-S NIKKOR 24-120mm f/4G ED VR is equipped with Nikon?s second generation Vibration Reduction system (VR II) which offers compensation for camera movement the equivalent to a shutter speed of approximately four stops faster, and couples well with the f/4 fixed aperture under low light conditions. The system incorporates two modes: Normal for general handheld shooting and Active to compensate for the mechanical vibration frequencies caused by planes and moving vehicles. 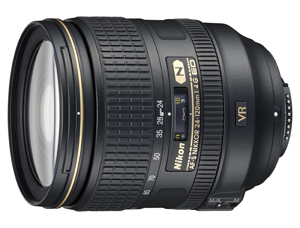 The AF-S NIKKOR 24-120mm f/4G ED VR takes the ?standard zoom? concept to another level to meet the demands of today?s high resolution FX format D-SLRs while maintaining excellent price/performance ratio.